When we first got here in 2006 this was an abandoned old bull pasture. The hill on which we were to build our house and stable was covered with an impervious blackthorn grove. Since it stood in the way of our human exploitation, we spent days chopping down and dragging away these bushes. The thorns made them tangle up like nothing else. The thorn needles themselves can easily penetrate any fabric and rubber boots are no exception. To chop down the bush trunks you must reach far in under the thorn covered branches and when all trunks are cut you must drag away all of it in one big heap of tangled up bushes. We quickly decided to leave bushes that were not immediately blocking our construction project. The way these wild blackthorns resisted our relentless conquest not only saved them from local extinction, but they also taught us a lesson. Most time of the year the Blackthorn (Prunus Spinosa) is a dull bush with strong pointy thorns, leafless in winter and plain green during summer. Its berries are bitter and seem useless. Then a few days in May the Blackthorns steals all attention from the landscape as its fragile white flowers completely covers the bushes. One heavy downpour of rain and the flowers are gone, but this year we have had several dry hot summerlike days and the flowers are thriving. The berries that come at the autumn are very similar to (European) blueberries, almost twice as big but not nearly half as sweet. The trick is to wait until the first night of frost, which magically enough transforms the astringent tannic acid to a sweet flavor. The tradition is to make sloe berry juice (slånbärssaft), but the uses are many; from sloe gin, tea and jelly to various medical uses, as well as ink made out of the sap. The hard wood is known to be used for teeth of rakes, walking sticks (i.e. for officers at The Royal Irish Regiment) and different works of turnery. A hedge of Blackthorn traditionally worked as a natural fence for critter. It is also said to be an excellent fire wood, if you have the patience to gather enough of it. The Blackthorn is widespread in Swedish coastal areas south of the 60th latitude, primarily in the open landscape at the edge of the forest. 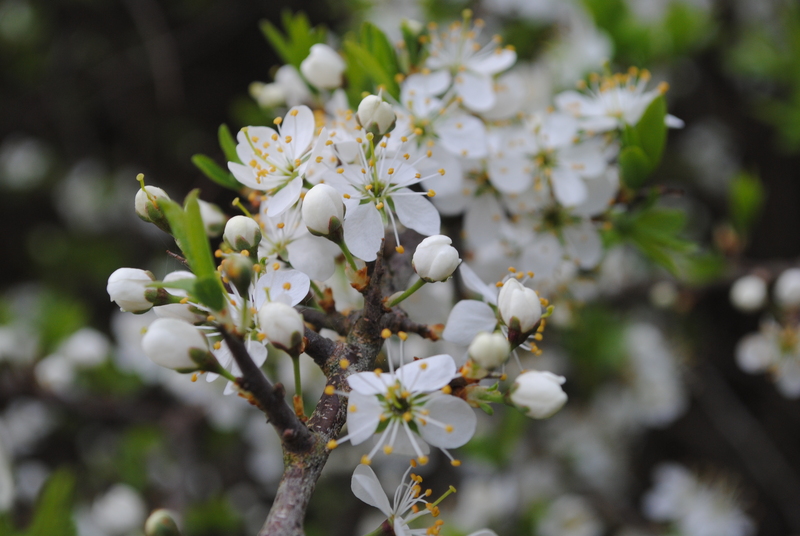 The usual name for Blackthorn is Sloe (Slån in Swedish) which sounds similar in most European languages and gives a hint about its ancient origin of use. It is known here at least since the Middle Ages, but sloe has been found in remarkable places like in the stomach contents of a 5,300-year-old human mummy nicknamed Ötzi, discovered in 1991 in the Alps along the Austrian-Italian border. Sloe is native in Europe, northwest Africa and the Middle East but also appears locally at the North American east coast as well as in New Zealand. It is hardy and grows in most soils, preferably alkaline soils. Sloe is an important food source for butterfly caterpillars and the bees like the flowers. The roots are shallow but far reaching making it difficult to move or remove. We have noticed that several species of birds use the bushes for protection and nesting. The berries are a good late season food source for some of our wintering birds. So the lesson being; Blackthorn is actually a very important plant and it is well adapted within a complicated ecosystem, despite (and maybe even because) of its apparent recalcitrance. In our civilized ignorance we sometimes tear up and destroy whatever does not cooperate with our own immediate interests. 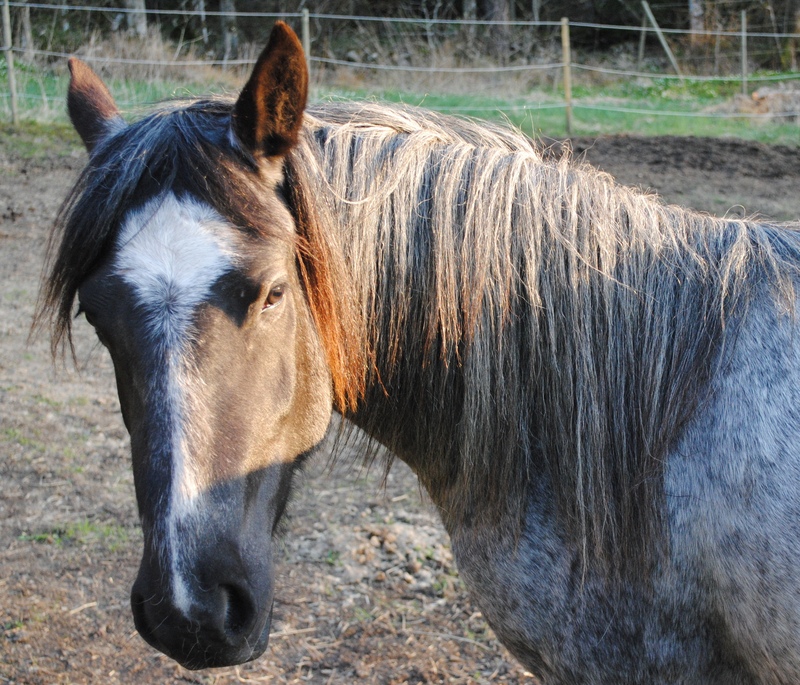 Not unlike other wild flowers, the Blackthorn shares some of the characteristics of a Nokota horse; beautiful, important and a real survivor. I conclude that it is by the most elusive of signs that the greatest of paths may be found and one step on that path must be to preserve the Nokota Horse by supporting The Nokota© Horse Conservancy. 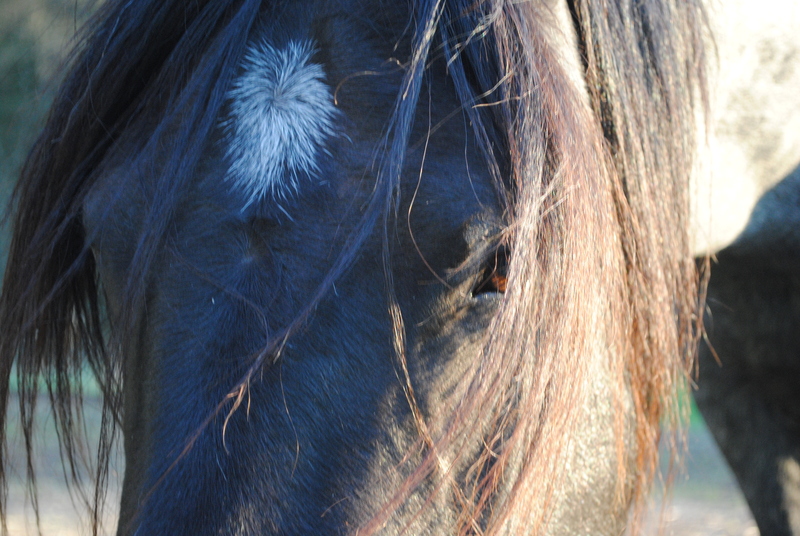 This entry was posted in Our horses, Thoughts and tagged Horses, Inspiration, nature, nokota, photography, Wild horses. Bookmark the permalink. 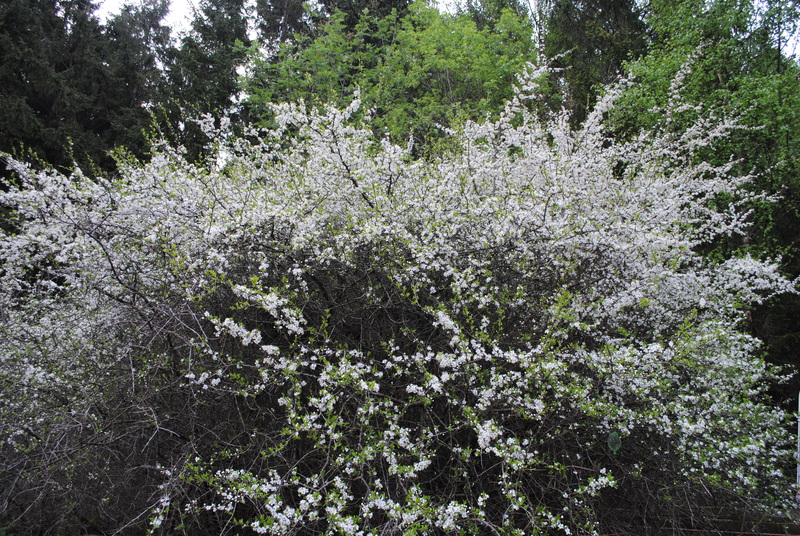 Thanks for posting: I learned a lot about the Blackthorn that reminds me of the blackberry bushes that still want to invade my yard and have similar white flowers. 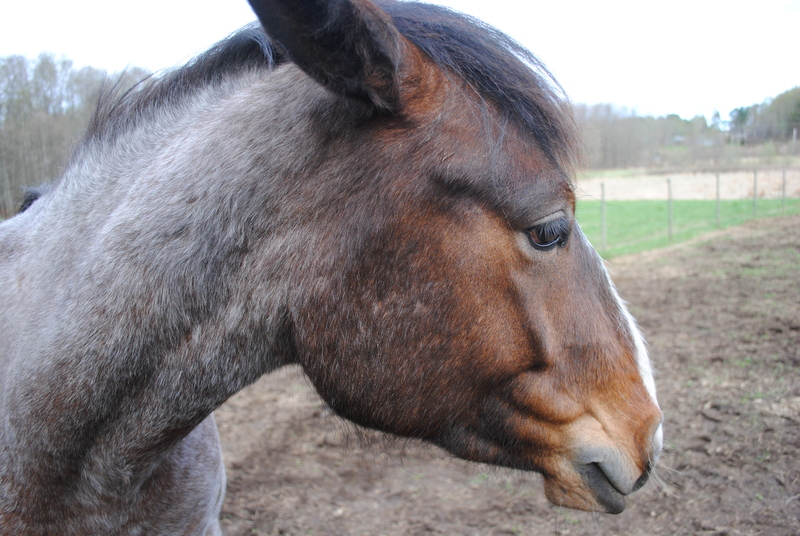 Beautiful horses, and great blog! So glad to learn about the Nokota breed!